Our ONNO-brand Premium Bamboo Tee! Zeus was the god of the sky and ruler of the Olympian gods. He overthrew his father, Cronus, and then drew lots with his brothers Poseidon and Hades, in order to decide who would succeed their father on the throne. Zeus won the draw and became the supreme ruler of the gods, as well as lord of the sky and rain. His weapon was a thunderbolt which he hurled at those who displeased or defied him, especially liars and oathbreakers. He was married to Hera but often tested her patience, as he was infamous for his many affairs. 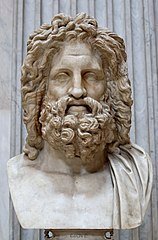 Zeus, the presiding deity of the universe, ruler of the skies and the earth, was regarded by the Greeks as the god of all natural phenomena on the sky; the personification of the laws of nature; the ruler of the state; and finally, the father of gods and men. Using his shield, the Aegis, Zeus could create all natural phenomena related to the air and the sky, such as storms, tempests, and intense darkness. At his command, mighty thunders would flash and lightnings would roll, wreaking havoc; or the skies would open to rejuvenate the earth with life-giving water. As the personification of the operations of nature, he represented the grand laws of unchanging and harmonious order, by which both the natural and the spiritual world were governed. He was the god of regulated time as marked by the changing seasons and the regular succession of day and night, in contrast to what his father Cronus represented before him; absolute time, i.e. eternity. As the ruler of the state, he was the source of kingly power, the upholder of all institutions connected to the state, and the friend and patron of princes, whom he guarded and assisted with his advice and counsel. He was also the protector of the people, and watched over the welfare of the whole community. As the father of the gods, Zeus ascertained that each deity perform their individual duty, punished their misdeeds, settled their disputes, and acted towards them on all occasions as their all-knowing counsellor and mighty friend. As the father of men, he took a paternal interest in the actions and well-being of mortals. He watched over them with tender solicitude, rewarding truth, charity, and fairness, while severely punishing perjury and cruelty. Even the poorest and most forlorn wanderer could find a powerful advocate in Zeus, for he, as a wise and merciful paternal figure, demanded that the wealthy inhabitants of the earth be attentive to the needs of their less fortunate fellow citizens. Zeus Is also called Jupiter, Dias. C. 1997-2015 GreekMythology.com. All Rights Reserved.